ABSTRACT: This paper discusses depictions of space in contemporary tourist souvenirs manufactured by private companies that explicitly undertake defining and promoting Taiwan for a local and international audience. They highlight “Taiwan” as the nation’s name, associate it with the island’s map as national territory, and fill this territory not only with iconic landmarks, but above all with ordinary, familiar spaces and sights. The latter are de-naturalised for the purpose of building national identity understood as a specifically Taiwanese way of life. As historical palimpsests, the depicted landscapes also construct a national heritage not based on a single, local tradition, but shaped by manifold native and external factors. This definition of Taiwan can be deemed a grassroots response to official undertakings in nation branding that frame the island as preserver of high, traditional Chinese culture and downplay politically sensitive local elements. Its non-antagonistic character may be a function of the medium (commercial popular culture), but may also reflect a new stage in the articulation of Taiwanese identity, based on the need to appeal to the entire national community, notwithstanding ethnic and political divides. KEYWORDS: national identity, tourist souvenirs, postcards, iconic sites, everyday sights, national heritage. ABSTRACT: In the early 2010s, under the second mandate of Ma Ying-jeou (KMT), plans to construct three Hakka tulou in western Taiwan aroused considerable discontent amongst a section of the Taiwanese population. Their disapproval manifested itself in the eruption of small-scale demonstrations and in the expression of differences of opinion and individual experiences in the cybersphere. As actors, internet users took on the role of citizen’s watch and people’s judge and revealed, through a critique of the three projects, the failings and tensions present in representative democracy both in terms of cultural identity and procedural mechanisms, highlighting opposed values of the various social agents. KEYWORDS: Taiwan, representative democracy, local election, Miaoli, tulou, Liu Cheng-hung, new media, actor, value, process. ABSTRACT: Recognition of persecution during an authoritarian era is an issue that has arisen in every society that has undergone a successful democratic transition in the second half of the twentieth century. The manner in which each country has dealt with the question in many ways reflects the circumstances of its democratisation, and its past. 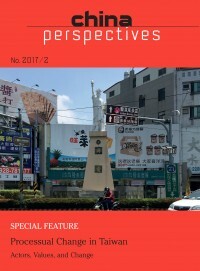 In Taiwan, the development of transitional justice has mainly focused on the recognition of the victims of two distinct historic experiences. This article aims to analyse the dynamic that has led to the recognition of the victims of the party-state that governed Taiwan from 1945 to 1992. KEYWORDS: transitional justice, Taiwan, Chiang Kai-shek, collective memory, White Terror, 228 Incident. ABSTRACT: Since 2008, the Taiwanese business group Want Want, having made a fortune in China, has returned to Taiwan to buy a major media group and attempt to exert political influence on Taiwanese society. This paper analyses the rise and rationale of this new type of media investor in the light of the business-government relationship under China’s model of state capitalism. According to the analysis developed in this paper, when China needed foreign investment in the early 1990s, Taiwanese investors were warmly welcomed by the Chinese government, which provided Taiwanese businesses with tax incentives at that time. After 2000, however, when not only domestic Chinese entrepreneurs emerged but also more non-Chinese investors entered the Chinese markets, Taiwanese businesses realised that the investment environment had become much more competitive, so they had to work hard on building ties with Chinese officials. Under these circumstances, Want Want bought into media in Taiwan as an asset to be used in order to build social ties with the Chinese government, but in doing so, Want Want has also triggered resistance from Taiwanese civil society. Future researchers and regulators can continue to watch and define this new type of investment, which has become increasingly significant in this region. KEYWORDS: Taiwanese business, Taiwan, media merger, media monopoly, cross-Strait relations, government-business relations. ABSTRACT: In 1999, the State Council set forth an urban social assistance program aimed chiefly at pacifying protesting laid-off workers and compensating for the breakdown of the work-unit-based welfare benefits that had obtained under the planned economy. While an initial goal was to ensure the political stability that would allow enterprise reform to proceed unchallenged, over time the content of the scheme shifted in line with new regime goals. First the program spread to the countryside, as the New Socialist Countryside model was installed. In the past few years, in line with a tightening of financial commitment, leaders have demanded that the able-bodied poor should work, not be succoured, and that the program’s allowances target the desperate. Also, beginning in 2014 and continuing into 2016 there has been heavy emphasis on fighting graft and corruption in the program. The paper details five alterations that have emerged – or policy slants for which earlier, less extreme changes in implementation have intensified – since Xi Jinping ascended to power. The big message here is that the regime has repeatedly reshaped this initiative to match the changing political agenda of the Party. KEYWORDS: poverty, social assistance, minimum livelihood guarantee, dibao, corruption, unemployment. ABSTRACT: The Wu Boliang affair reported in the Chinese media several years ago is symptomatic of the complex socio-political situation in the Chinese countryside. Wu Boliang was one of the first entrepreneurs from his village to develop the cultivation of mandarin oranges, and in 1993 and 1997 he acquired several orchards under the “responsibility system” in order to make them productive with the help of the township. But the latter did not provide him with the necessary funds in time, obliging him to borrow in his own name to cover the wages of the agricultural workers and the purchase of pesticides, fertiliser, etc. As the years went by and debts piled up, the township still did not reimburse him, forcing Wu Boliang to undertake legal proceedings. Although he immediately won his case against the township, the sums owed to him were still not paid, and he had no other option but to become a petitioner. In 2014, 20 years after the signing of the contract, the matter was finally settled. My in-depth analysis follows this particular case over a period of about ten years, and gives a detailed insight into the intricate interplay between the various mechanisms within the hierarchical pyramid of the Chinese society. This enables me to study the behaviour of the agents – both individuals and institutions. KEYWORDS: China, rural society, family, legal proceedings, debt, min (the people) and guan (official circles).